The Greatest Gift Ever Given is a fruit of Ridenour’s life-long search for answers: a book that is at once deeply thoughtful, humorous, philosophical and poetic. In Part I, ‘Raising the Foundation’, he studies the Judeo-Christian mysteries. After humanity’s ‘fall’ into materialism, these mysteries signal the development of human individuality. The impulse for self-hood continues with Christ, who brings a new path of divine love. But the mystery of Christ leads naturally to his shadow. Today, we can no longer escape the question: Where in the world is Judas? Without Judas’s betrayal, Christ’s greatest gift could never have been given. We can’t reject Judas, but should transform him within ourselves. In Part II, ‘Lowering the Temple’, Ridenour relates the theme of metamorphosis to the contemporary world. Once guided by initiates, personal transformation now needs to blossom from within each individual human soul. The topic of evolution takes us to a consideration of the perennially-controversial Charles Darwin, as well as the intuitive approach of Goethe and the living thinking of Rudolf Steiner. 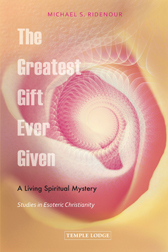 A rich treasure-trove of ideas, The Greatest Gift Ever Given sharpens a dynamic focus on current spiritual needs and contributes a thought-provoking response to them. ABOUT THE AUTHOR: Learning to read at age five from a young adult book on evolution, having out-of-body experiences as he grew older and waking up as an adolescent with the certainty that he had a soul, gave a budding Michael Ridenour a growing sense of reality that culminated with a Christ experience in his middle teens. But he didn’t know what to do with any of it. A few degrees in physics, math, French and English literature left him intellectually richer but clueless. A two-year stint teaching English to Buddhist monks in Thailand, though enormously satisfying, still fell short. Then he discovered the spiritual perceptions of esoteric Christianity and spiritual science given by Rudolf Steiner. This grounded him in esoteric literature and enabled him to complete a book on the Templar architecture of Chartres Cathedral (Hermetica Press, 2009). Then, several years later, the same stream flowed into the present volume. He continues his career as a writer and Waldorf teacher in Southern California.